Some people say they're "inspired," but sometimes people just downright copy another guy's good idea. I'm not sure which one I'm doing, but I know I was inspired by Coach Farm's Peppercorn Chevre to try my own spin on it. Their cheese is a tiny cone, shaped much like the Loire Valley classic chevre, Chabichou du Poitou (which sounds like a Fat's Domino song, shab-bee-shoe dew phwat-two). Along with being a beautiful, soft-ripened goat cheese in its own right, Coach Farms adds a smattering of zesty, whole peppercorns to the cheese. And I love the fact that they're using green peppercorns, which just remind me of so many classic French dishes that douse beef or pork in a sauce of cognac, demi-glace, and green peppercorns. As my supply of goat's milk is spotty at best, I opted for raw cow's milk. 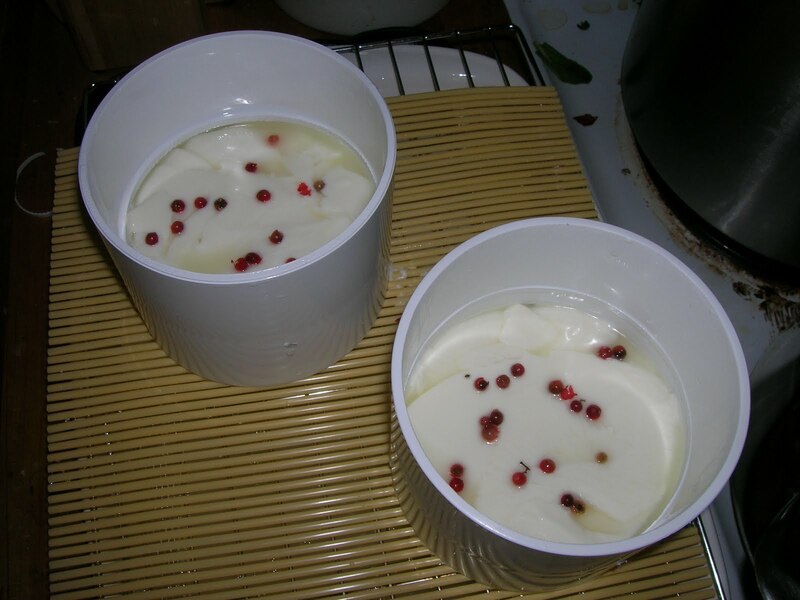 I also love the fruity and fiery bite of Brazilian pink peppercorns, plus I thought they would stand out nicely in the white curd. 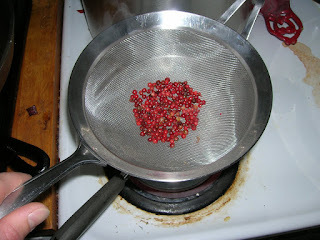 I steamed the peppercorns for five minutes to sterilize them, then dropped a few between scoops of fresh curd as I ladled them into their hoops to drain. Results to come in a few weeks of aging!